Expo aficionados tend to be collectors, and one of the joys of a world’s fair is all the opportunities it presents for collecting mementos such as posters, guidebooks, and pavilion pins. The successful world’s fair in Italy, Milan Expo 2015 is coming to a close. As it approaches the end of its six-month run, it is on target to reach 19 million visitors. I’ve written a book’s worth of expo articles this year, most of them on the serious side dealing with organization, funding, mission, sponsorship, construction, visitation and so forth. I’ve chronicled US Pavilions at world expos from 1982 to 2015. This story is on the lighter side: Collecting. 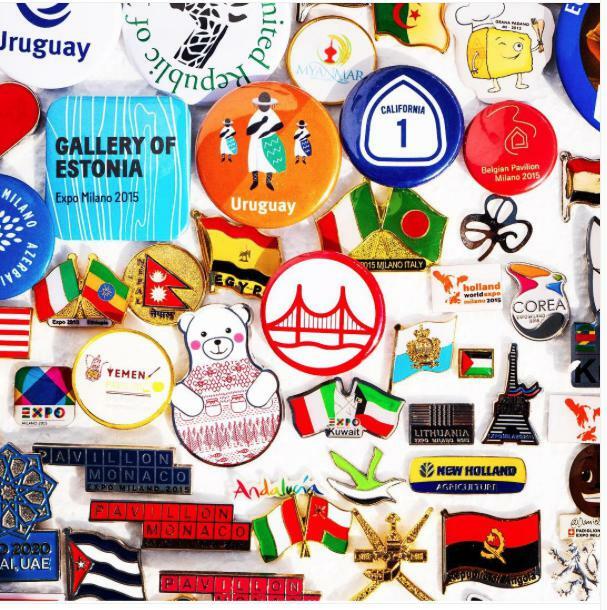 Image at top: This Milan Expo 2015 visitor has collected pins from several World’s Fairs. Here he has just picked up one from the Kuwait Pavilion. The participating nations of a world’s fair design and produce unique, commemorative lapel pins. These are handed out to visiting dignitaries and sold in gift shops. Visitors and even workers at world expos tend to become avid collectors trying to put together a full set. 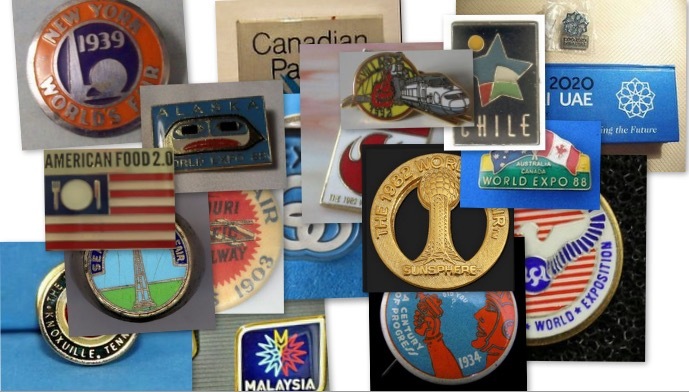 The pins even become a commodity, with the scarcer ones taking on the highest value and people making exchanges to round out their collections. 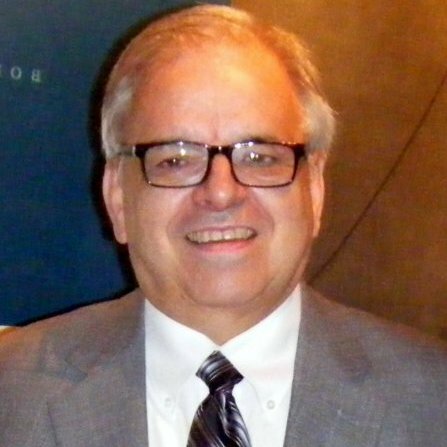 An unofficial exchange rate comes into play. It can become quite competitive. At one expo I recall an enterprising individual developing a pin collector handbook where a person could check off each pin they had acquired. 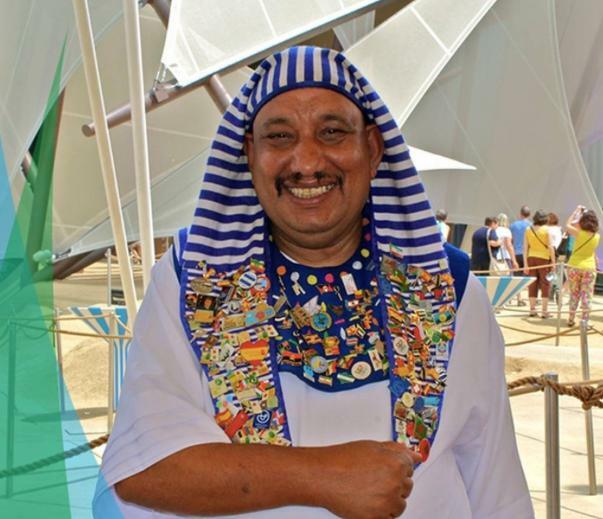 Guides at many pavilions wear the pins they have collected on their uniforms. At the US Pavilion at Knoxville Expo 82, one guide’s offical vest was so weighted down with lapel pins that it was a struggle to get it on and off. My favorite story on pins happened at Vancouver Expo 86 where I served as US Pavilion Director. Then Vice President Bush was about to visit and the head of his advance team, who also happened to be a friend of mine, told me that Bush was a pin collector. I had our guides go out and collect pins from every pavilion on the expo site. We had them mounted in a frame and I presented it to the Vice President at the conclusion of taking him on a pavilion tour. A week later I received a note from him thanking me for the pins. From his reaction when I handed it to him, I believe that it made his day. You can probably tell that I’m an avid world expo Pavilion pin collector myself. Those in my own collection bring back fond memories of past events. If you are fortunate enough to attend Expo 2017 in Astana, Kazakhstan or Dubai Expo 2020, make sure to save some space in your luggage for expo pins.